Justice Hussein Baba-Yusuf of a Federal Capital Territory High Court, Maitama, yesterday ordered the Department of State Security (DSS) to produce the former National Security Adviser, Sambo Dasuki before the court. The court issued a production warrant against DSS to produce Dasuki, who is already in the custody of the government. The judge held that it is the responsibility of the prosecution to work with the DSS to produce Dasuki in court. When the matter was called for continuation, yesterday, the former NSA Boss was conspicuously absent in court. The prosecution counsel, Oluwaleke Atolagbe, informed the court that he was ready to call his witness, but the defendant was not in court. In his response, counsel to the second defendant (Aminu Baba-Kusa ) Solomon Umoh, said, “Without playing a hide and seek, your Lordship may agree that it is now common knowledge that the defendant is in custody of the state. He said with the discretion of the court, he can either issue a production warrant but that is only done when the man is in willful custody. It is not available now, because nobody signed him in. He also said the court can issue a bench warrant and that is where the man is on the run to escape justice. He drew attention of the court to January 25, when they prayed the court to consider section 352(4) of ACJA 2015. The section permits the court to continue with the trial where the defendant is absent for minimum of two times when the case is adjourned for trial on that day. ‘’My lord would recall that this court ruled that the defendant is in custody of the DSS, not the Economic Crimes and Financial Commission (EFCC). This position was upheld by the Court of Appeal and the Supreme Court,’’ he posited. In his ruling the court held that first defendant(Dasuki) is in the custody of the DSS, adding that it is the responsibility of the prosecution to work with the DSS to facilitate the presence of Mr Dasuki in court. Consequently, he issued a production warrant on the DSS. Meantime, the matter was adjourned to May 24, for the continuation of trial. 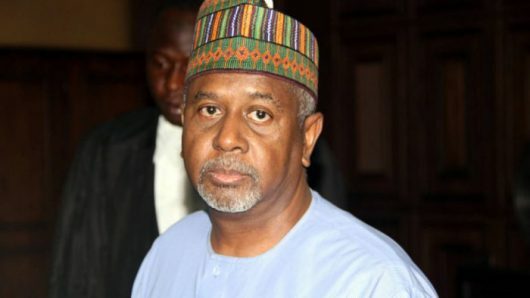 It will be recalled that Dasuki, alongside Aminu Kusa, Acacia Holdings Limited and Reliance Referral Hospital, has been in detention of the State Security Service (SSS) since December 2015, despite about six court orders that granted him bails.